2.1 What are Coastal Highways? Coastal highways are those roads influenced by their presence in or near the water level, wave, and sand transport environment unique to a coast. While normally associated with the oceans, the coastal environment includes the Great Lakes and any other non-riverine water bodies that can be affected by coastal storm events. Every coastal state has highways that are flooded and damaged in coastal storms. Some of these roads are perpendicular to the coast and serve as access and evacuation routes. Some of these roads are parallel to the coast either right along or inland from the shore. Some of these roads are major highways that run across or along bays or estuaries. Two of American society’s most storied love affairs – beaches and cars – come together on coastal highways. Some of our coastal roads are famous to the point of being a part of the national culture. Examples of famous coastal roads include Florida’s A-1-A and California’s Pacific Coast Highway(see Figure 2.2). Not only do Americans drive their cars to the beach on coastal highways, but these same highways can influence the quality of the beach itself in some situations. Thus, context-sensitive design principles should be appropriately applied along the coast. Figure 2.2. 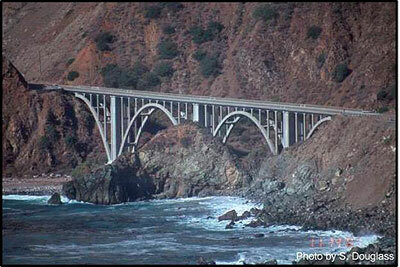 Bridge on the Pacific Coast Highway (California Route 1). A study by the University of South Alabama estimated that there are roughly 60,000 road miles in the United States that are occasionally exposed to coastal waves and surge (Douglass, et al. 2005). This value of coastal road mileage was estimated by measuring the road miles in flood zones near the coast. Figure 2.3 illustrates the number of roadway miles within FEMA’s 100-year floodplain in coastal counties on a State-by-State basis. The 60,000 mile nationwide total is based on estimates of the portion of those miles which are “coastal” as opposed to upland riverine flooding. The study only considered those coastal States within the conterminous United States – excluding Alaska and Hawaii. However, the basic approach would be applicable for these States as well. Appendix B details the approach and specific outcomes associated with the study. After Hurricane Katrina, FHWA conducted an assessment of coastal bridges potentially vulnerable to failure from coastal storm events. Using very broad criteria, the assessment estimated that there are over 36,000 bridges within 15 nautical miles of coasts (FHWA 2007). Of these, over 1,000 bridges may possibly be vulnerable to the same failure modes as those associated with recent coastal storms (FHWA 2005/2007). Millions of Americans want to live near the coast and millions more want to vacation there. Beaches are the most popular tourist destinations in the nation and tourism is the largest industry in the nation. The primary way that Americans get to the beach is by automobile on roads. Figure 2.3. Estimates of road mileage in the 100-year coastal floodplain. There are clear, multi-decadal trends of coastal state and coastal county population increases. Within the last three decades, more than 37 million people and 18 million homes have been added to America’s coastal areas (US Commission on Ocean Policy 2004). The economic growth in coastal counties is increasing at a higher rate than inland counties. Because much of the actual “beachfront” property is already developed in America, much of the growth and new development is in the area near the coast but some miles inland from the water. The implication is that these people will want to use the road system to get to the beach and, therefore, demand for coastal roads will increase. Given these demands, in the coming decades America’s coastal highway system – as part of the overall civil engineering infrastructure – will most likely face a multitude of societal and natural stresses. The coastal roadway system can be considered as a subset of the transportation system with these unique design challenges. 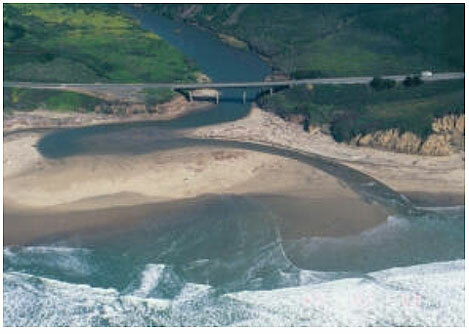 Many different natural processes and forces impact roads and bridges near the coast. The natural stresses on the coast are challenging today and may be increasing in a number of ways. 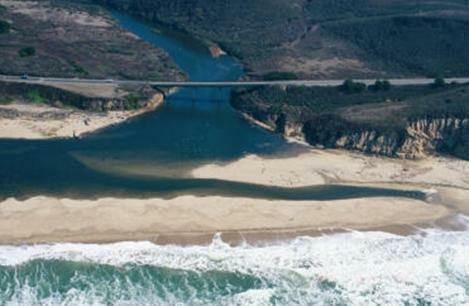 This document focuses on the natural processes that are not typically experienced by inland roads but present unique challenges for coastal roads. Water levels are constantly changing along the coast. Tides rise and fall daily along all the ocean coasts. The range of tides varies dramatically along the United States coast. Near Anchorage , Alaska, the tide range is often over 20 feet. Near Pensacola , Florida, the tide range can essentially be zero during some days of the month. The Great Lakes have fluctuations in average water level throughout the year in response to seasonal rainfall differences that can approach two feet as well as multi-year fluctuations in response to drought cycles that can approach five feet in elevation. However, these changes are not always related to astronomical tides and rainfall variations. Sea level has been rising along most United States coasts (relative sea level rise) at rates that vary by location but average about six inches per century. Many climatologists expect global warming will cause an increase in sea level rise rates as well as increased storm frequencies and intensities. Storm surge can cause significant changes in the water level along the coast in addition to the tides. Storm surge is an increase in water level along the coast in response to the storm winds and pressures. Storm surge in Hurricane Katrina (2005) along the Mississippi coast exceeded 27 feet (Douglass, et.al. 2006). The Great Lakes can experience water level changes of up to ten feet in response to a severe storm. Major weather patterns cause high storm surge and waves. The great coastal storms of the southeast include tropical storms and hurricanes. The major coastal storms of the northeast include those as well as extra-tropical storms including “Nor’easters.” The great coastal storms of the west coast include the El Niño related storms and the “pineapple expresses.” The major storms of the Great Lakes include the winter north winds associated with arctic high pressure systems and their related weather fronts. The term “sustained wind” refers to surface wind speeds (10 m above the surface) that persist for durations of one minute. Hurricanes are created in the tropical oceans, frequently in the eastern Atlantic Ocean and are then powered by the heat from the sea. The hurricanes typically are steered westward by easterly trade winds. The Coriolis effect provides the characteristic cyclonic spin of these storms. Around their core, winds grow with great velocity, generating violent seas. As the fierce winds accompanied by the low pressure move ashore, the storm surge grows and creates extensive flooding. In addition, the hurricane carries with it torrential rains and can produce tornadoes. The original Saffir-Simpson scale also included bands of minimum central pressure and maximum storm surge limits. However, modern meteorology typically focuses exclusively on wind speeds when categorizing storms. The use of the Saffir-Simpson scale as the basis for coastal engineering design decisions can be problematic because the scale is based solely on windspeed and not the critical phenomena of storm surge elevations and waves. Damages from hurricanes extend well inland. Frequently, the most noted or newsworthy aspect of hurricane damage results from flooding along the coastal area. This is particularly important in low-lying areas such as the coastal barrier islands. Of course, the flooding will continue upstream in every inlet open to the ocean. The damages for each level of hurricane increase with the intensity of the storm. Cyclonic events such as extratropical storms form when unstable air produces significant temperature and pressure differences. At times, such systems may stall off the coast and produce long (i.e., several days) periods of high winds and inland rainfall. These events rarely obtain hurricane level wind speeds; however, they can cause significant coastal hydrological effects and wave damages. Many historically significant events on the upper Mid-Atlantic and New England coasts were a result of Nor’easters. The “Ash Wednesday” storm of March 1962 was formed by the combination of several slow moving coastal low pressure systems along the Atlantic seaboard. This combined storm resulted in hurricane force winds and water levels 9 or more feet above mean low water level in areas of Maryland and Delaware over a period of several days (to contrast, for this same region, the 1933 “hurricane of record” produced water elevations 7 feet above mean low water). Likewise, the popularized 1991 “All Hallow’s Eve” or “Perfect Storm” produced 5 days of high wave action, coastal erosion, and washover (USGS 2003). These extratropical events are not limited to the Atlantic Coast; Florida’s west coast experiences severe flooding from such events. During one March 1993 event, at a location north of Tampa Bay, the resulting inundation (and damages) was similar to those predicted to occur from a Category 1 hurricane (Citrus County 2000). Likewise, the Great Lakes coastal regions endure wave damages during winter extratropical events (USGS 2003). There are also longer-term fluctuations in mean sea level along our coasts in response to weather systems. One such fluctuation, El Niño, refers to a periodic rise in equatorial Pacific Ocean surface temperatures that affect global weather patterns. The mean sea level along the Pacific coast can be over six inches higher, when averaged over an entire year, during El Niño years. Historical data reveal a relationship between El Niño and Southern California tropical cyclones and flood events (USGS 2003, FEMA 2004). Additionally, El Niño is responsible for increases of water surface elevation as eastward flowing water accumulates on the West Coast shore (USGS 2003). Some research indicates that both El Niño and La Niña episodes have some relationship in affecting wind conditions and the California current (Schwing and Bograd 2003). Figure 2.4 and Figure 2.5 illustrate differences in coastal water surface elevations at a Northern California bridge waterway during El Niño (October 1997) and after El Niño (April 1998) (USGS 1998) episodes. Waves are one of the major forces affecting coastal systems including roads and bridges. Large, damaging waves occur during the great coastal storms mentioned above. Waves have the ability to generate tremendous forces and cause considerable damage when they are riding on top of storm surge and are thus able to strike roads and bridges that are not typically designed for such forces. For example, the waves in the Gulf Coast hurricanes of 2004-2005 caused $ billions in damage to bridges including moving bridge deck spans that weighed over 340,000 lbs each (see Figure 2.6). Figure 2.5. 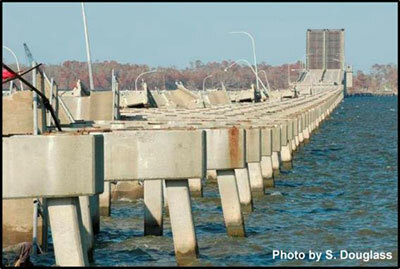 US Highway 90 bridge across Biloxi Bay, Mississippi, after Hurricane Katrina. (photo looking northeast from Biloxi 9/21/05). Storm waves have the ability to erode coastal dunes and bluffs. Roads can be damaged by this erosion. Storm surge contributes greatly to this erosion by allowing the waves to attack the dunes or bluff at higher elevations than normal. The combination of storm surge and waves can cause overtopping and overwash on some low elevation roads. Overwash in Hurricane Isabel (2002) caused portions of the barrier island west of Cape Hatteras , North Carolina (Pea Island), to breach and form a new inlet (Figure 2.7). This overwash and breach completely removed a stretch of road, North Carolina Highway 12 (NC 12), which could not be repaired until the barrier island was artificially rebuilt. Similar vulnerable areas exist on this and other barrier islands and coastal regions. Waves also have the ability to move tremendous amounts of sand down the coast in littoral drift or longshore sand transport. Thus, our shorelines are always changing locations in response to changes in wave conditions and local sand supplies. Barrier spits, islands, and inlets migrate. Shorelines accrete or recede over the long-term in response to changes in the sand transport. Figure 2.6. 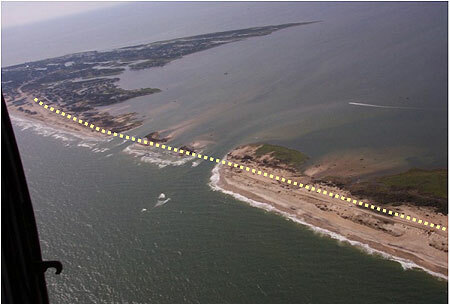 Breaches in Outer Bank barrier island caused by Hurricane Isabel in 2002 (NC 12 ROW is dotted line). Most of the United States coast is experiencing long-term shoreline recession. The causes of this are natural, e.g. responding to sea level rise, and man-made, e.g. interruptions in sand movement along the coast by ship channels. Roads that are located near the shoreline can often be threatened or even destroyed by this coastal erosion. For example, a twenty mile long portion of Texas Highway 87 has been completely closed and destroyed by coastal erosion. Tsunamis (“tidal waves”) normally result from an underwater disturbance (usually an earthquake) that triggers a series of waves that can travel many hundreds or thousands of miles. In the open ocean, the waves may move 450 miles per hour. Reaching shallower waters, the waves decrease speed, but gain amplitude. Tsunamis appear on the coast as a series of successive waves where the period from wave crest to wave crest can range between 2 and 90 minutes (but normally between 10 and 45 minutes). Typically, the first of these waves is not the largest. A 1964 Alaskan earthquake sent tsunami waves between 10 and 20 feet high along the coasts of Washington, Oregon, and California. In regards to frequency, Hawaii and Alaska can expect a damaging tsunami on the average of once every seven years, while the West Coast experiences a damaging tsunami once every seventeen years (FEMA September 1993). Upland runoff can affect storm surge heights and flow conditions in tidal waterways if significant runoff discharges occur during the surge. Hurricanes can produce significant amounts of rainfall and extreme flooding in river systems much farther inland than the flooding caused by the surge. Upland flood discharges can reduce incoming flood tides and increase outgoing ebb tides. Floodwaters moving at high velocities can lead to hydrodynamic forces on structural elements in the water column, including drag forces in the direction of flow and lift forces perpendicular to the direction of flow. Oscillations in lift forces correspond to the repeated shedding of vortices from alternate sides of the structural element (for example, these vortices can often be seen in the wakes behind bridge pilings in rapidly moving water). High-velocity flows can also move large quantities of sediment and debris. Current FEMA Flood Insurance Study (FIS) “V” zone mapping procedures cannot accurately predict locations where high-velocity flows and their impacts will be felt. High velocity flows can be created or enhanced by the presence of manmade or natural obstructions along the shoreline and by “weak points” or “hot spots” formed by bridges or shore-normal canals, channels, and drainage features. For example, anecdotal evidence after Hurricane Opal struck Navarre Beach , Florida, in 1995 suggests that large engineered buildings channeled flow between them, causing deep scour channels across and washing out roads and homes situated farther landward. Observations of damage caused by Hurricane Fran in 1996 at North Topsail Beach , North Carolina, show a correlation between storm cuts across the area and ditches and bridge locations along the frontage road (FEMA, 1999). Other coastal processes that can affect coastal roads include common coastal ice problems in northern climates, wave overtopping and flooding, and wave spray. Some highway planning and design issues are unique to the coast. For example, the design of revetments that are exposed to wave attack can require additional considerations beyond those in non-coastal situations. These revetments can provide embankment protection along roads or at approaches to bridges. Another issue is the possible relocation of roads in response to coastal erosion. Historically, some coastal roads have been abandoned or relocated landward due to shoreline migrations. The coastal engineering options for stabilizing shorelines (coastal structures and beach nourishment) can be considered when a road is threatened by erosion. The elevation of coastal roads and bridges can be manipulated to avoid some of the unique coastal forces. For example, the bridges that were destroyed by Hurricanes Ivan and Katrina are being rebuilt at much higher elevations. A related issue is the wave loads and subsequent vulnerability of existing bridges that might be exposed to similar conditions. Each of these issues is discussed in later Chapters in this document. The coast presents many unique challenges for roads including some unique environmental and aesthetic issues. Coastal roads traverse bays, estuaries, beaches, dunes and bluffs. These are some of the most unique and treasured habitats for humans as well as a variety of plants and animals. The list of endangered species requiring these coastal habitats for survival includes numerous sea turtles, birds, mammals, rodents, amphibians and fishes. As described earlier, this document intends to provide the typical State DOT and FHWA hydraulics unit with sufficient information for them to understand issues in the coastal environment. For many coastal projects – especially complex or major projects – a State DOT should consider obtaining specialized assistance or review from coastal engineers. Coastal engineering is a well established specialty area of civil engineering. Coastal engineering is the planning, design, construction and operation of infrastructure projects in the unique wave, water level and sand transport climate along the coast. Coastal engineering makes extensive use of the sciences of nearshore oceanography and coastal geomorphology as well as geotechnical, environmental, structural and hydraulic engineering principles. Traditional coastal engineering projects involved improving navigation or developing beach erosion solutions. Over time, the scope of coastal engineering projects has broadened from these traditional ones to include, among other purposes, new beaches for recreational purposes and projects to improve coastal water quality. There have been some coastal engineering projects related to coastal highways. The design environment; the coastal water level, wave and sand environment; is the primary distinguishing factor of coastal engineering from other civil engineering disciplines. The design environment is very challenging. It varies with time, since design conditions are often affected by storms that contain much more energy and induce very different loadings from those normally experienced. Two characteristics of a good coastal engineer are a formal education in coastal engineering and experience in coastal engineering. Coastal engineering is primarily taught at the graduate level in the United States and abroad. The formal graduate education in coastal engineering, like any other specialty area of civil engineering, is unique and extensive. Thus, the formal education of coastal engineers is significantly different than the education of most civil engineers. Most coastal engineering graduate programs include three or more graduate courses in wave mechanics, two or more courses in other coastal hydrodynamics such as tidal circulation and modeling, two or more courses in coastal sediment transport, and several courses in the functional and structural design of built infrastructure in this environment. Roughly two dozen American universities have some formal graduate level coastal engineering program with a few faculty members teaching in the field. At least four universities; the University of Florida, the University of Delaware, Oregon State University, and Texas A&M University; have four to eight faculty members in coastal engineering. The practice of coastal engineering is still much of an art. This is for a variety of reasons including that the physical processes are so complex, often too complex for adequate theoretical description, and the design level of risk is often high. Consequently, practitioners should have a broad base of practical coastal engineering experience and should exercise sound judgment based on that experience. There is no substitute for the judgment that comes from coastal engineering experience. There is no formal code of practice or specialty certification in coastal engineering in the United States today. There is an organization called the Association of Coastal Engineers (ACE) that requires a formal education and experience in the field for full membership (www.coastalengineers.org). The field of coastal engineering is summarized in a few textbooks including Kamphuis (2000) and Sorensen (2006). Significant portions of the field are summarized in other textbooks that are mentioned in subsequent Chapters. The USACE has produced a Coastal Engineering Manual (USACE 2002) (CEM) that attempts to summarize the aspects of the field that are of most importance to that agency’s mission. The CEM is over 2500 pages and a foot wide on the bookshelf. The CEM replaces the Shore Protection Manual (SPM) (USACE 1984) that, with its predecessor editions, was often called the “bible of coastal engineering.” Another coastal engineering manual is Herbich (2000). The breadth and the changes in the field of coastal engineering are best captured by professional specialty conferences and journals. The International Coastal Engineering Conference series is held every two years and typically has 400 to 500 presentations. There are several series of American Society of Civil Engineers (ASCE) sponsored specialty conferences including the “Coastal Sediments” conferences, the “Coastal Structures” conferences, the “Solutions to Coastal Disasters” conferences, the “Ports” conferences, and the “Coastal Zone” conferences; as well as others. Each of these conference series has a longer, formal title that is more explanatory but these are the commonly used names. These conference series also have hundreds of presentations. Most of these conferences publish written proceedings. The ASCE Journal of Waterway, Port, Coastal and Ocean Engineering is published six times per year. Other journals with coastal engineering research results include the Journal of Coastal Engineering, Shore and Beach, and the Journal of Coastal Research. The National Beach Preservation Technology conference is sponsored annually by the Florida Shore and Beach Preservation Association. There are many related conferences and journals beyond these. A goal of this document is to encourage the better integration of coastal engineering principles and practices in the planning and design of roads along the coast. Later chapters address some of the coastal engineering applications related to highways. As American society continues its great migration to the coasts in the face of changing natural stresses on the coast, the opportunities for fruitful integration of coastal engineering in the transportation engineering process will increase. Some coastal states are already encouraging, and even requiring, the inclusion of coastal engineers in multi-disciplinary teams addressing highway and bridge projects near the coast. This document should aid the transportation professional in understanding when input from a trained coastal engineer would be helpful to the design team.